The FX529 is a single-chip CMOS 1200 baud FFSK Modem, designed primarily for use in trunked radio systems but can also be employed in other general purpose radio or line data communication applications. This device conforms to both the PAA 1382 French trunked radio, and the proposed ETSI I-ETS 300 230 ‘Binary Interchange of Information and Signalling’ specifications. 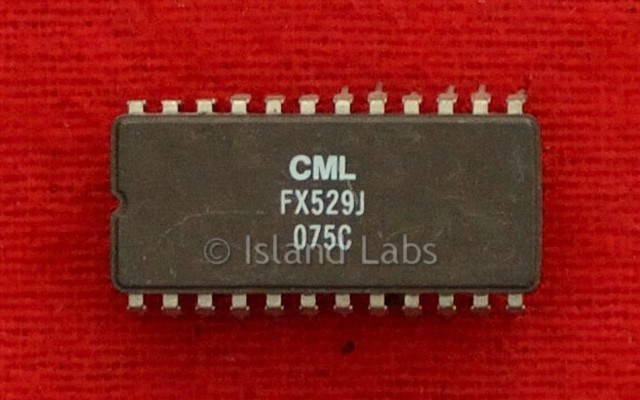 The FX529 is full duplex at 1200 baud and includes an 8-bit parallel microprocessor interface and a programmable timer which may be set for interrupt periods of between 8 and 120 bits. Preamble data and an error-check word are automatically generated in the transmit mode. Error checking is performed and the 16-bit SYNC (“1011010000110011”) or SYNT (“0100101111001100”) word detected in the receive mode. An on-chip Xtal/clock generator requiring an external 4.032MHz Xtal or clock input provides all microcircuit filter sampling clocks and modem timings whilst also supplying a 'Clock 4' output (1.008MHz). Pin and function compatible with the FX429, the FX429 data sheet should be consulted when using this device. The FX529, which has a power saving facility, requires a single 5-volt power supply and is available in both cerdip DIL and plastic SMD packages. This unit is the ceramic one.